While physical activity is very important for children, it is sometimes easier said than done. There are often challenges that make it harder for families to be active. Sometimes, families just don’t know where to start! Children should move multiple times every day. Remember that physical activity doesn’t need to be overly structured or involve formal programming. It could be taking a walk outside, dancing to music, or playing on the playground. Physical activity should be fun. If children enjoy the time they spend being active, they are much more likely to continue being active. Visit the Activities & Games section for some great ideas! Let your children explore different types of physical activity so they have the opportunity to discover what they enjoy the most. Try games, activities, and a variety of sports in both structured and unstructured settings. Also incorporate outside activity. When children play outside, they move more and sit less. They also develop their movement skills, use their imagination and learn about their physical limits. The children in your life look up to you, so set an example of an active lifestyle. You don’t need to run marathons, play professional hockey or be a prima ballerina. Simply being active each day by walking, jogging, cycling or swimming is enough to promote well-being. Also, play simple games with your children. They will love you for it, and you’ll likely rediscover the joy of being a kid again! Find practical solutions to overcoming barriers to activity. Try to incorporate physical activity into your child’s daily life. For example, get off the bus one stop earlier and walk the rest of the way. Take the stairs instead of the elevator. Park the car farther away from your destination. Plan in advance by scheduling time each day to be active. Set a timer to go off every hour and use this time for a quick energizer such as an active game or song, such as Simon Says, the Hokey Pokey or Head, Shoulders, Knees and Toes. These activities will increase activity levels, break-up sedentary time and reinvigorate your child. Incorporate skill development into your daily routine. For example, encourage your child to hop to the washroom, or skip to the table for meals and snacks. Encourage your child to stand when colouring or completing a puzzle. Have a ‘boredom buster’ jar at home and fill it with different ways to be physically active. If your children announce that they are bored, have them select an activity from the jar. Be prepared to be physically active during unexpected down time. This could be going for a quick walk when the doctor is late for an appointment, or playing a game of Simon Says while waiting for the bus. If you feel there isn’t enough free time in the week to incorporate physical activity, review your daily activities. Are there time slots that could be replaced with being physically active? Or activities you can modify to include physical activity? Create your own games and activities. Formal programming isn’t necessary. Take advantage of community resources such as playgrounds, parks, trails, and recreation facilities. Look to your community recreation department. Many offer physical activity programming, and some programs are free, low cost, or subsidized. Try activities that don’t need specialized and expensive equipment. Use equipment from the dollar store such as balls, hula hoops and pool noodles. You can also check out the pet section for amusing toys such as rubber chickens and balls that make noise. Experiment with household items rather than traditional play toys. Examples include sponges, laundry baskets, bed sheets, colanders, tape, and balled up pieces of paper. Use your imagination and get creative! Alternatively, play games and activities that do not require equipment. Make sure your child is wearing appropriate safety equipment such as helmets for bike riding or skating and swimming aids when in the pool. Examine equipment and activity spaces regularly to ensure there are no hazards. Ensure your child is wearing appropriate footwear. Make sure the space is appropriate for the activity. Remove any tripping hazards such as toys and books. Involve your child in this process. Go over safety rules with your child. Involve your child in identifying these rules. Start your activity with a slower warm-up to prevent injury. Ensure activities and physical skills are appropriate for the age of your child. Build up to harder skills. Remember that the benefits of physical activity outweigh the risks. Sedentary behaviour is linked to numerous chronic diseases. Shift your perception to value long-term health as much as safety. Recognize the difference between danger and risk. When children are supported to take developmentally appropriate risks, they are more physically active and have more fun. Make physical activity fun. If your children are enjoying themselves, they will be more likely to continue to be active and have an interest in being active the next time. Provide an inclusive environment including opportunities for children of all abilities and interests to participate in all activities. Use cooperative games that do not exclude anyone or ask anyone to sit out. Depending on the child, remove or reduce elements of competition. Try games, activities, sports, and formal skill development opportunities. Use non-sport specific activities if sports do not appeal to your child. Use non-traditional equipment, such as stuffed animals, to add an element of fun. Because children have short attention spans, ensure activities take place in short bursts with frequent breaks. Watch out for signs of fatigue during physical activity and end the activity before your child starts losing interest or stops having fun. Vary the activities to maintain your child’s interest. Choose times to be active when your child is well-fed, rested and alert. Ensure games and activities aren’t too complicated. Limit the number of rules and use short and simple activity descriptions. Encourage your child to choose the activity. Encourage your child to create their own games and make up their own rules. Encourage your child to pick the equipment they want to be active with. Let them choose non-traditional equipment, such as stuffed toys, which will increase the fun. Remove any elements of negative pressure. Create opportunities for success through achievable challenges. If your child is successful, he or she will want to continue participating. Limit the amount of screen time your child is exposed to. For those under 2 years, screen time is not recommended. For children 2-4 years, screen time should be limited to less than one hour per day. Remove screens from the bedroom. If they aren’t accessible, children can’t use them. Provide alternatives to screen time such as being active, creating arts and crafts or working on a puzzle. Have your child stand while doing these activities to reduce their amount of sedentary behaviour. As a role model, try to limit your screen time as well. If your child has a favourite show, have your child ‘earn’ the time to watch it by being active. For example, playing outside for half hour or walk with you to run an errand. When your child’s favourite show is over, turn off the television. Do not leave it on long enough for the next show to come on. While your child is watching his or her favourite show, incorporate activity breaks during the commercials. Activities could include jumping jacks, bouncing or rolling a ball back and forth, or an active song such as the Hokey Pokey or Head, Shoulders, Knees and Toes. Provide opportunities for free play or other unstructured forms of physical activity that aren’t as skill dependent but still promote being active, such as dance or exploring outside. As a role model, provide motivation and build a child’s self-confidence by using encouragement and positive feedback. Do not force your child to perform an activity. Praise your child when he or she is doing things correctly, and provide ongoing constructive feedback. Allow your child to outperform you. This will provide a sense of accomplishment. Remember that learning a new skill takes time. Go slowly and gradually increase the time and intensity of the skill. Also provide plenty of opportunities for repetition to learn and practice. If your child is having difficulties with a skill, try teaching it a different way or use different games and activities that use the same skill. Provide diverse and interesting opportunities for skill development through a variety of games and activities. Set realistic expectations for your child and modify skills and activities when necessary. Modify the equipment by using larger, softer balls or shorter, lighter bats and racquets. Choose larger goals and target areas. Also use non-traditional equipment, such as a stuffed animal, which will be more fun for the child. Make the space smaller to allow more opportunities for success. Children won’t need to travel, throw an object or kick a ball as far. Alternatively, increase the size of the activity area to allow all children to participate at the same time. Modify games and activities so children gradually progress to desired skills. Rather than bouncing consecutively, start with dropping and picking up an object. Rather than throwing and catching, have children start by passing an object back and forth. 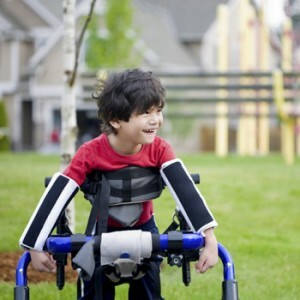 If you have a child with special needs, consider what he or she may need to participate in activities. This could include modifying the equipment or rules. For more information, please visit the Activities & Games section. Remind yourself that your child depends on you to be active. Understand the benefits of physical activity for your child. Be a positive role model and replace negative thoughts about being active with positive ones. Create some accountability by planning ahead and scheduling time into each day to be active. If you are worried about your skill level, learn with your child! Think of the benefits you will get while being active too! Encourage outside play as children are more active when outside. Even if you don’t have a yard, take advantage of local playgrounds, trails, and parks. Use on-the-spot activities which do not require a lot of space. Visit our Activities & Games section for some ideas! If space permits, designate a specific area of the home which is free from obstacles and that your child can be active safely. Move furniture to the perimeter of the room so your child has more space to be active. Use the seasons to your advantage and choose weather-specific activities. When it is hot, set up a sprinkler or water play in the backyard. You could also visit your local splash pad or pool. When there is snow, build a snowman, make snow angels or climb snow mountains. If the weather is wet, jump in puddles or dance in the rain! 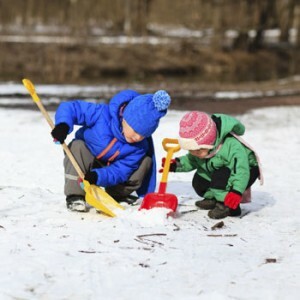 Ensure your children are dressed appropriately for the weather so they will be comfortable in the elements. This includes using sunscreen, ensuring children are properly hydrated in the heat, and dressed warmly on cold days. Have a set of go-to activities that can easily be done inside if the weather is poor. This could include dancing to music, building a fort, or on-the-spot movements. Visit our Activities & Games section for some ideas!